I <3 homemade cookies. And I wish I made them more. I really wish I made these more…all my favorite flavors of fall…in cookie form. While it’s still humid and up in the 90s some days, we have had a few “tastes of fall” and cool, crisp mornings. I often make pumpkin muffins or pumpkin oatmeal or pumpkin quinoa (recipe coming Friday!) and find that I have a little pumpkin leftover, as most of the recipes I use don’t use the entire can. Now I have a great solution…a simple, after school snack or dessert for the boys and I use up all the pumpkin in the can! Also, be on the lookout…my “never pay more than” price for canned pumpkin is $1 per can. Last year, I bought 20 cans of organic canned pumpkin when it was on sale for $1 at Sprouts…I’ll have my eyes out and ears to the ground, awaiting that deal again! In a mixing bowl or stand mixer, cream the butter or margarine with the sugars. Add the vanilla, eggs and pumpkin puree and combine well. Add the flour, baking powder, cinnamon, cardamom and salt and mix until batter forms. In a small bowl, combine the sugar, cinnamon and nutmeg. Using a small ice cream scoop or cookie scoop, scoop ball of dough and form into uniform circle. Roll in the sugar-spice mixture. Place on a greased baking sheet or baking sheet with non-stick cooking mat. Bake in the preheated oven for 10 minutes. Let cool slightly before serving. This recipe is featured on SouthernPlate.com’s Cookie Plan Monday edition of Meal Plan Monday . 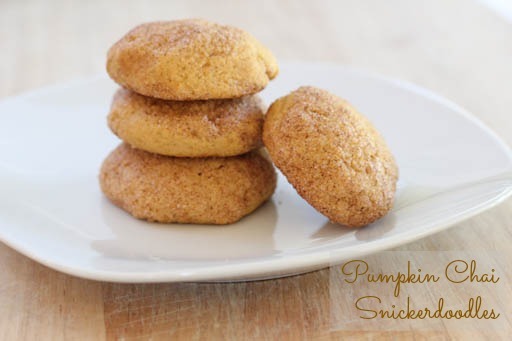 These look so delicious – a perfect fall treat! hmmmm I wonder if these would work without the cardamom, it is the only ingredient I don’t have on hand…..
You could probably use ginger instead. It would be more like pumpkin pie than chai though. For the person who asked- don’t skip the cardamom. These were amazing!!! When this recipe came up I immediately e-mailed it to family and then promptly forgot about it. My husband recovered it from his inbox last night when we were craving a sweet but didn’t know what to make. Holy COW deliciousness. So glad we came back to them!